Only two words can accurately sum up today’s World Endurance Championship season ender: Holy. Crap. If you expected Porsche’s No. 17 car to have an easy drive home into a championship win, surprise! I don’t think anyone could have called the ending of the 6 Hours of Bahrain until the very end. The 6 Hours of Bahrain was insanity from the start, with Timo Bernhard in the leading No. 17 Porsche 919 LMP1 having to come in early to fix an engine actuator. No. 17 not only led the drivers’ championship going into the race, but it had started from pole. That’s right: the car everyone was watching going into this race immediately fell five laps down from the leaders—behind all of the other manufacturer LMP1 efforts. Keeping Porsche’s No. 18 sister car in front then became the name of the game, but the Audis were quick and kept pulling out in front. Finally, a crack started to show in Audi’s famed reliability in the third hour of the race—and it was a crack in the brake disc of Loïc Duval’s No. 8 Audi R18. A telltale cloud of smoke puffed out of the left front wheel well of Duval’s car, sending it into the garage for repairs. Several suspension components were replaced along with the broken brake disc. Eighteen people crowded around the No. 8 car in the garage to get it back on track as soon as possible. A full-course yellow for debris helped slow down the rest of the cars while the No. 8 team was in the pits, but ultimately, the team fell behind the rest of the manufacturer LMP1-class teams during the stop. Bad luck struck both Audis after the halfway point, though. The No. 8 car went back into the garage after a spin, and the No. 7 had to come in with a right rear wheel that wasn’t on right. Finally, the biggest blow to Porsche’s struggling No. 17 car came with a little over an hour left in the race. The championship leading team wheeled its car back into the garage, yanking off the engine cover and furiously zip-tieing a fix together. Porsche later said that they ran into the same engine actuator issue from the start of the race, but it was clear now that their hybrid system was also borked. Thus, Mark Webber was sent back out in the No. 17 Porsche with no hybrid assistance to the front wheels. Porsche runs a big 8-megajoule hybrid system, so carrying any part of it around as dead weight instead of as a source of power slows the car down immensely. Webber’s car had to restart on its internal combustion engine power only and was off-pace out of the pits. Meanwhile, Oliver Jarvis in the stricken No. 8 Audi was still well behind Webber in sixth place, but gaining on the Porsche. In order for the No. 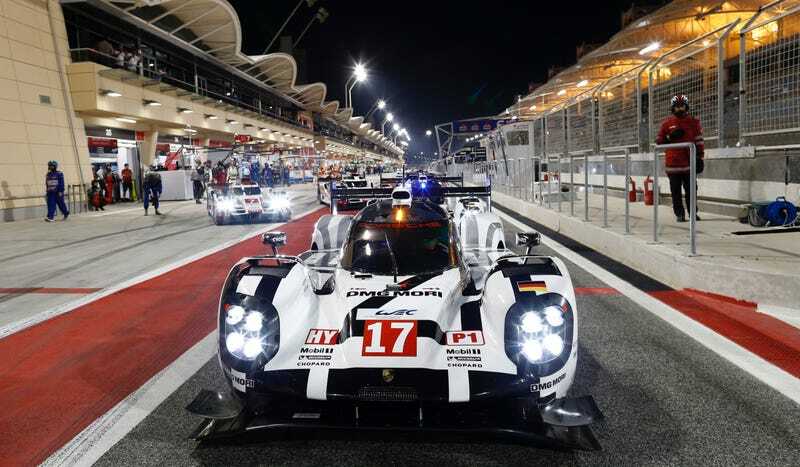 17 team of Mark Webber, Timo Bernhard and Brendan Hartley to win the season driver championship in the top LMP1 class, however, their limping car had to finish. No finish? No points. Points are paramount when the second place competitor in the championship is riding around in second place, battling your team’s other car for the lead. One other factor started to play into the race at this point: tires. The Bahrain circuit was so rough on tires that teams were now changing sides of tires, much like NASCAR teams tend to do with the one side that takes more of a beating than the other. Knowing that they only had a limited number of tires for the weekend, Webber was sent back out with new tires on the left and tires that had three laps on them on the right. With less than an hour to go, we needed to throw a monster truck announcer in the booth with Hindhaugh and company. “You paid for a whole seat, but you’re only going to need THE EDGE.” Everyone was watching Webber’s busted Porsche try to eke out laps. Will he make it to the end? With less than 50 minutes left, Webber’s carsputtered on track and then fired back up. Porsche has at times had the drivers reset systems without coming into the pits like that, but needless to say, you could hear fans of the No. 17 car gasp as the car looked as if it was about to die on track. With 18 minutes to go, Webber gave us all another scare as he briefly lost the engine. The car sputtered in a corner that’s usually a 140 mph turn! Webber’s last pit stop for fuel was especially trying. The engine had to be turned off to fuel, which meant taking a risk that the car wouldn’t fire back up. On the restart, the car sputtered and died on pit lane for what seemed like an eternity, even though it was just a brief moment. Finally, Webber’s car fired back up to turn more laps. Audi’s No. 8 car was gaining on the No. 17 Porsche until Audi made a grave mistake in the last hour. One of the set of tires they put on the cars — captured by the RFID tags built into each set — was not in the team’s allocation for the weekend. A system at the end of pit lane detected the unapproved set as the car went back onto the track. No. 8 was called back into the pits for a three-minute penalty, effectively ensuring that Porsche’s No. 17 car would take fifth place. Ultimately, the two Porsches made it happen. Webber limped the No. 17 car home in fifth place after being told to “cancel all boost” on the last lap, and Neel Jani brought home a win in the No. 18 car. Hartley, Webber and Bernhard are officially the 2015 WEC season LMP1 driver’s champions. While the Volkswagen Group was having its fight out in front, however, Toyota was quietly making clean laps and staying out of trouble. This gave retiring driver Alex Wurz’s team a podium finish in Toyota’s No. 2 car for his last race with the WEC. Toyota has struggled with pace all season long, so getting an unexpected podium for the team is extra special. Elsewhere in the field, KCMG and G-Drive’s No. 26 car were once again in a close battle for the lead. KCMG has had terrible luck lately that’s made Porsche’s unlucky No. 17 look like a lottery winner in comparison. Not only did the FIA surprisingly and inexplicably uphold the reprimand against the KCMG team for being hit from behind at the 6 Hours of Fuji, but they were also demoted a spot in qualifying for today’s 6 Hours of Bahrain for violating the track limits. KCMG was forced to start from third position in LMP2, directly behind G-Drive’s No. 26 car, who they trailed by only 13 points in the series championship. Still, G-Drive’s Sam Bird and KCMG’s Nick Tandy gave us an epic fight for the lead and the championship at times during the race. Bird’s car ultimately won the battle and the war, though, with Bird making an epic pass for the class win in the No. 26 G-Drive LMP2 with 15 minutes to go. With that, G-Drive’s No. 26 team of Sam Bird, Roman Rusinov and Julien Canal claimed the LMP2 championship. Rebellion’s No. 12 car may have already won the privateer LMP1 class at Shanghai, but this time, the No. 13 Rebellion Racing car won the race. This means that Rebellion claimed first and second place in the LMP1 privateers’ championship over ByKolles’ lone entry in third. While we’re all certain that Porsche’s LMP1 effort will continue, there’s been some question as to whether their factory Porsche Team Manthey will be around next year in the LMGTE Pro class. It’s as if the team has been answering that question lately with wins in order to prove the program’s worth. The No. 92 Porsche Team Manthey claimed yet another win for the factory team today, giving team driver Richard Lietz the driver’s championship and Porsche the GT Manufacturer’s Cup season championship. Finally, LMGTE Am class honors went to the SMP Racing team of Andrea Bertolini, Viktor Shaitar and Aleksey Basov. SMP’s fifth place finish at Bahrain was enough to give them the championship. Aston Martin Racing’s team of Pedro Lamy, Paul Dalla Lana and Mathias Lauda took the race win today in LMGTE Am. Interestingly, a Patrick Dempsey-less Dempsey Proton Racing car came in third in today’s race, with Christian Ried filling in for the actor as he was scheduled to film something that was way less interesting than racing a Porsche today. The best part of it all is that there were so many open titles going into the very last race of the season, and one of them was for the winning team of top-class drivers. There weren’t any formatting gimmicks to direct attention to the end of the season. No playoffs or double-points finales. The racing was just that close. With all the different titles at stake, there was no shortage of battles to pay attention to all season long, and no one managed to just run away with it. Porsche’s streak of wins may have looked like a slam-dunk, but anyone who’s been paying attention to the series can tell that it was a crazy battle until the very end. I can only hope that next season sees an even closer top fight with a completely new Toyota, an Audi team that’s thirsty for the top again and perhaps a Nissan in the mix, too. Meanwhile, I’m going to sit down and breathe a little bit, or maybe have a nap. I just spent the past six hours watching a Porsche try not to break, and that was some of the most nerve-wracking television I’ve watched all year long. Full season results can be viewed here.